John Gardner was recently selected as the new director of Residence Life. Since fall 2009, Gardner has been serving as the interim director after starting at Truman in the summer of 2008 as assistant director of Residence Life. Gardner earned a master’s degree in higher education from Iowa State University and a bachelor’s degree in history from Lewis & Clark College in Portland, Ore. He has been working with higher education students in various capacities for the last 10 years, first as a resident assistant at Lewis & Clark College, followed by three years as a hall director at Northwest Missouri State University and two years as a graduate assistant for multicultural student affairs at Iowa State University. As the director, Gardner is responsible for the overall operations of Residence Life, including personnel, budget, facilities, programming and polices among other duties. Truman has an on-campus living capacity of approximately 2,700 students, roughly half of the total student body. Medical Leave Bank open enrollment for staff is currently under way and will be available through June 30. The purpose of this program is to provide additional paid medical leave for staff who have exhausted their accrued medical and vacation leave benefits as the result of their own catastrophic illness or the need to care for a spouse, child or parent suffering from a catastrophic illness. It was established in 2007 as the result of a resolution passed by the Board of Governors. Open enrollment for this program takes place annually from June 1-30. Employee eligibility requirements include the following: must be a non-faculty employee who earns medical and vacation leave; must have been employed at the University for a period of one year or more; must have worked 1,250 hours or more during the previous 12 months; and will have a minimum of 10 medical leave days and five vacation days after the initial donation made to the Bank. Employees must be an active member of the Bank to apply to use the program. Further details regarding the program may be found at http://hr.truman.edu/programs/mlb/MLB_procedures.pdf. Membership in the Bank begins with an employee’s contribution of at least one day of leave (medical or vacation) during an Open Enrollment period and continues from year-to-year with the annual donation of leave until the member submits a revocation form or until a member’s termination of employment, retirement, death or failure to donate a leave day during the Open Enrollment period for the next fiscal year. Additional donations of leave time to the Bank may be made at any time however, donations occurring outside of the Open Enrollment period do not qualify the employee for membership. To enroll, employees should log in to TruView and select the “Staff” tab. Employees may check their eligibility status by clicking on the “Medical Leave Bank Enrollment Eligibility Checklist.” Once eligibility is confirmed, employees may contribute medical or vacation leave to the Bank. The maximum annual donation of leave time that can be made by any eligible employee is 40 hours of medical or vacation leave. For additional questions regarding this program, contact Human Resources at 785.4031. Eleven students graduated as Honors Scholars this May. 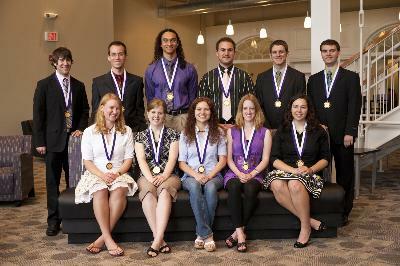 The candidates were recognized at the Honors Scholar medal ceremony May 7 in the Student Union Building. First row (left to right): Anne Woodruff, Amanda Olp, Jessica Ponder, Kelly Merritt and Loren Dunham. Second row (left to right): David Taylor, Nicholas Wilsey, Andrew McCall, Grant Berry, Jacob Sanning and Tyson Koenig. Not pictured: Jacob Schrum. More than 200 Truman students have graduated as Honors Scholars since 1994. To become an Honors Scholar, students must complete five approved courses, with at least one from each of the four areas of mathematics, science, social science and humanities with a grade point average of at least 3.5 in those courses and an overall cumulative grade point average of at least 3.5. Only grades of “A” and “B” may count toward the five Honors Scholar courses and students who complete a single undergraduate major may not satisfy Honors Scholar requirements with any course within their major. For more information, visit the Honors Scholar webpage at http://honors.truman.edu. State Representative Rebecca McClanahan was named the NEMO Nurse of the Year during the 9th Annual Capstones of Nursing at Truman April 29. Kelly Freeland, family nurse practitioner for Northeast Missouri Health Council and Crown Clinic, was named the Acute Care Preceptor of the Year. North Shelby school nurse Edie Finke, BSN, RN, was named the Community Health Preceptor of the Year. 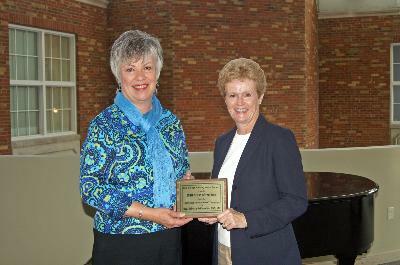 State Representative Rebecca McClanahan (left) accepts the NEMO Nurse of the Year award from Shirley Riley, President of Rho Omega Chapter of Sigma Theta Tau International Nursing Honor Society. Kelly Freeland (middle) accepts the award for Acute Care Preceptor of the Year. Freeland is a family nurse practitioner at Northeast Missouri Health Council and Crown Clinic. Pictured left to right: Pam Melvin, associate professor of nursing, Tina Roybal, nursing class of 2010, Freeland, Karli-Rae Kerr nursing class of 2010, and Sarah Delaware, associate professor of nursing. 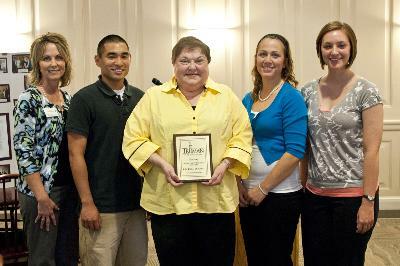 Edie Finke (middle) accepts the award for Community Health Preceptor of the Year. Finke is the North Shelby school nurse. Pictured left to right: Pam Melvin, associate professor of nursing, Brian De Guzman, nursing class of 2010, Finke, Ashley Swain, nursing class of 2010, and Karen Wolberg, nursing class of 2010. The Kiwanis Club of Kirksville is using proceeds from its annual Farmers Market to assist area students in pursuit of an agriculture degree at Truman. Dahn Kemp of Clarence, Mo., was recently selected to receive the Kiwanis Farmers Market Annual Scholarship in the amount of $1,000. Kemp, a freshman at Truman, is the son of Rick and Sharri Kemp and a graduate of North Shelby High School. He is a member of the University football team and serves as the historian for the Collegiate Farm Bureau. In addition to school, Kemp currently manages one farm on his own and another with his father. He has been renting land since he was a sophomore in high school, and wants to own his own farm someday. After graduation he plans to return home and work with his family’s Angus cattle. To be eligible for the Kiwanis Farmers Market Annual Scholarship, a student must meet the following criteria: majoring in agriculture; active involvement in service while in college; have a minimum grade point average of 3.0; and demonstrate participation and leadership in school and community activities. The Institute of International Education, in cooperation with the U.S. Department of State and the J. William Fulbright Foreign Scholarship Board, is pleased to announce the launch of the 2011-2012 Fulbright U.S. Student Program competition. For more than 60 years, the federal government-sponsored Fulbright U.S. Student Program has provided future American leaders with an unparalleled opportunity to study, conduct research and teach in other countries. Fulbright grants aim to increase mutual understanding among nations through educational and cultural exchange while serving as a catalyst for long-term leadership development. The Fulbright U.S. Student Program awards more than 1,500 grants annually and currently operates in more than 140 countries worldwide. Fulbright English Teaching Assistantships are now available to more than 50 countries. Fulbright grants provide funding for round-trip travel, maintenance for one academic year, health and accident coverage and may also provide full or partial tuition. Applicants to the Fulbright U.S. Student Program must be U.S. citizens at the time of application and hold a bachelor’s degree or the equivalent by the beginning of the grant. In the creative and performing arts, four years of professional training and/or experience meets the basic eligibility requirement. Professional applicants lacking a degree but with extensive professional study and/or experience in the field in which they wish to purse a project may also be considered. The Fulbright U.S. Student Program does not require applicants to be currently enrolled in a college or university. Applications from young professionals interested in an international experience are also encouraged. For more information, interested individuals should visit the Fulbright U.S. Student Program website at http://www.us.fulbrightonline.org. Students currently enrolled at Truman should contact campus Fulbright Program Adviser Maria C. Di Stefano at mdistefa@truman.edu for more information. Applications must be submitted electronically by Sept. 21, 2010. Since its inception in 1946, the Fulbright Program has provided more than 300,000 participants worldwide with the opportunity to study, teach and conduct research, exchange ideas and contribute to finding solutions to shared international concerns. In the past 64 years, more than 114,000 students, scholars and teachers from the United States have benefited from the Fulbright experience. The Fulbright Program is a program of the Bureau of Educational and Cultural Affairs of the United States Department of State. Financial support is provided by an annual appropriation from the United States Congress to the Department of State and by the participating foreign governments and host institutions in the United States and abroad. The Presidentially-appointed J. William Fulbright Scholarship Board formulates policy guidelines and makes the final selection of all grantees. The Institute of International Education administers and coordinates the Fulbright U.S. Student Program on behalf of the U.S. Department of State, including the annual competition for grants. Taiwan at Truman is looking for host families for Father’s Day weekend, June 18-20. Seventeen high school aged Taiwanese girls need families to house them and introduce them to American culture. This will be a great intercultural opportunity for the students to experience an American lifestyle. Host families will also have the chance to learn of Taiwanese culture within their homes. To make an appointment and keep your wait shorter, sign up at http://www.redcrossblood.org. Multiple Communication Disorders Truman alumni also presented at the annual convention of the Missouri Speech-Language-Hearing Association in April 2010. Instructors using SMART Classrooms this fall will need to complete orientation this summer. The Learning Technologies Team has scheduled several summer SMART Classroom Orientation sessions for July and August. These sessions will provide fundamental tools to help be successful in a SMART Classroom. A more advanced session for those who wish to learn some of the additional capabilities of a SMART Classroom is also being offered. Plans are being made to provide individual one-hour “play dates” in the multi-media lab before classes start. These play date time slots will appear soon on registration page at http://eventmanager.truman.edu/generallist.asp?Department=Learning%20Technologies. Looking for a good book to read this summer? Check out a best seller from the Library’s Popular Reading collection (formally called Browsing). The Popular Reading collection has been moved to the west side of the gallery to make way for the Library café coming soon. The next issue of the Truman Today will be available online June 28 and in print June 29. All submissions should be made by June 23 to tmiles@truman.edu. 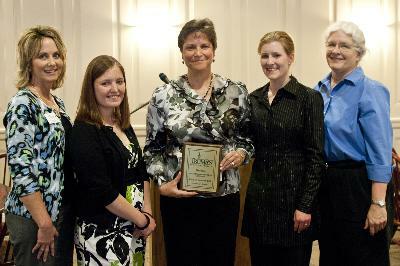 Erin Goggin was named the Outstanding Undergraduate Student in Russian during the 2010 Academic Honor Awards, which took place May 7 in the Georgian Room of the Student Union Building. Diane Tobin Johnson, associate professor of communication and liaison for the Truman in Washington Program, along with Brent Foster, a communication major and May 2010 graduate, were featured in a webinar entitled “Engaging Learners Through Internships” as part of the Academic Leadership Webinar Series hosted by the American Association of State Colleges and Universities. They joined Dr. George D. Kuh, director of the Center for Postsecondary Research at Indiana University, and Dr. Joseph Johnston, senior vice president for the Washington Center for Internships and Academic Seminars. Representatives from Richard Stockton College of New Jersey also participated in the webinar.